Junk and debris cluttering up your home can do much more than just annoy you. When your home or place of business becomes cluttered with unwanted items and other junk, the situation begins to add stress to your life that you’re unaware of. This stress can build and build over time until finally you just can’t take it any longer. This is a life that no one wants nor deserves to live. Don’t worry though, my friends. I have the perfect remedy to all your junk issues if you live in or near the Grapevine area. The answer is The Stand Up Guys Junk Removal Crew! The Stand Up Guys do it all in Grapevine! We can take care of any and all types of junk and debris issues that are cluttering up your home or life. Don’t fret over your clutter any longer, simply let go and let The Stand Up Guys relieve you of your worries. 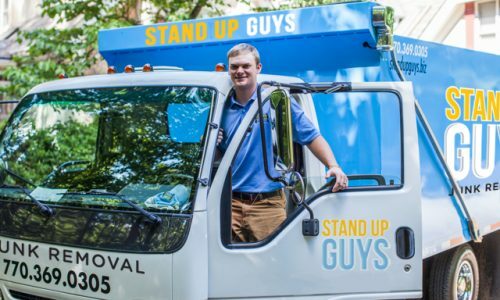 When you hire The Stand Up Guys Junk Removal Crew, your burden is over. All you have to do is simply point out what it is you want gone and we’ll take care of the rest. In Grapevine we take care of all the heavy lifting, loading, clearing, cleaning, hauling and disposal. Yes, we really do it all. The Stand Up Guys have earned a stellar rapport with the residents and businesses of Grapevine over the years for quite a few reasons. One major reason being that our customer service and customer care is second to none. We not only ensure that all of our Grapevine customers are happy and satisfied with our service, we make sure they blown away by us! That’s the Stand Up Guys way! Grapevine is quite an awesome city with an even better location. The city is located SMACK-DAB in the middle of the Dallas-Fort Worth Metroplex. I mean literally. Grapevine is 22 miles from downtown Fort Worth and 24 miles from downtown Dallas. The city is a big time destination for visitors that want to see as much of the Metroplex as possible, but even more, Grapevine is quite the attraction for people looking to move into the Metroplex. The city has so much to offer it’s residents, the list goes on and on. Grapevine is the place to be in Texas, you can ask anyone. In 2007 CNNMoney.com even rated Grapevine as one of “America’s Best Places to Live.” With accolades like this and simple word of mouth, the word has gotten out there that Grapevine is a destination for a lot of people. The city has been booming in population over the last 10-20 years because of it. In the 1990’s the cities population rose over 145%! With all of the new coming in though, there are still a lot of residents that are doing what they can to preserve the historic feel of Grapevine. Mainly the well-known Downtown Historic Corridor of the city. With the right efforts, they will be able to keep everything the way it is. One of the best parts about living in Grapevine is that you have access to a top notch junk removal crew like The Stand Up Guys. The Stand Up Guys will take any and everything for our Grapevine customers, and we do it all for a great value!